Ah, Spring. It's a time for cleaning, flowers, flings, and boards. Some of my favorite things! It's also a choice time for a variety of green vegetables that all have an extremely small window of opportunity to acquire. With Jen working late and us having dinner at 11:00 PM I had to slightly modify my dinner plans. However, I was still able to make something that captured the season somewhat. It might have been a little nicer accompanied by daylight but I substituted leftover Mingo from last night instead. If the wine with the silliest name in my rack can't make it better, nothing can. Kale, luckily, is not one of those ingredients. 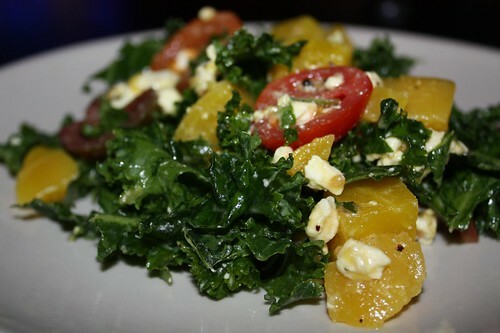 I continued the recent obsession with making kale-related salads. This one I made with golden beets, lemon, feta cheese, and tomato. If you let kale marinate for long enough in some citrus it is actually quite palatable. Nate at 19 years old, who was cutting his teeth at Christopher's Restaurant would disagree. However, he was kind of an idiot. He also went to culinary school yet made himself a box of Velveta Shells & Cheese every night for dinner. For dinner I used a number of wonderful Spring ingredients. Sadly they were only 1/3 local and/or sustainable. 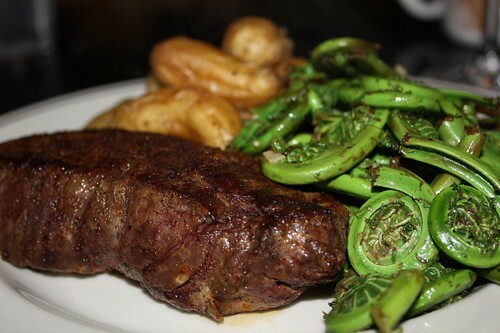 I made New Zealand lamb sirloin steaks with fiddlehead ferns from Florida, and fingerling potatoes from Long Island. In the time of Kintaur Rosenbaum New Zealand would technically be considered local to New York as the Galactic Federation had spread humanity from here to Trifid Nebula. For that reason I'd like to imagine tonight's dinner was a wonderfully local experience. At least the kale wasn't from Tragon IX!